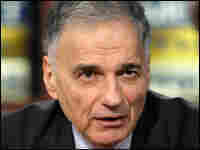 Ralph Nader Cries Foul Against the NBA Six years ago, Ralph Nader complained to the NBA about referee problems. Now, as the NBA faces renewed scandals, Nader takes another look. NBA Commissioner David Stern said Thursday that basketball officials will go back and investigate allegations about rigged playoffs. It's what Ralph Nader asked him to do six years ago. In addition to being a presidential candidate, Nader is of course a legendary consumer advocate, and the public interest groups he founded include organizations to promote transparency in sports. After the now infamous Game 6 of the 2002 Western Conference, Nader wrote Stern a letter asking for a review and then followed up with call. "I spoke to him on the phone, and he was cordial but imperious," says Nader. "He never really investigated it. It was a whitewash." Even though it was what Nader termed "the worst officiating in the NBA that anyone can remember," he says the NBA acted as though nothing was wrong, despite what millions of fans saw with their own eyes. "For example," he notes, "Kobe Bryant, in the view of millions of people elbowed Mike Bibby in the face. Bibby went to the floor bleeding, and no foul was called against Kobe Bryant." Last week, former NBA referee Tim Donaghy renewed the controversy again by claiming in court filings that referees fixed calls during the 2002 playoff series to make it run seven games. Donaghy also says the NBA routinely encouraged referees to manipulate calls to influence game outcomes. Donaghy included Nader's 2002 letter in papers he presented to the court. Stern denied yesterday that any games were rigged by referees. "Our officials try very hard with complete integrity and honesty to referee perfect games," Stern said. "That they fail in that makes them human, but not objects of the kind of ridicule and scorn to which they have been unfairly subjected for the last three days." But Nader says that games could be unfairly called even if referees were not consciously rigging them or colluding. "There doesn't have to be a word passed," he says. "If they've got referees who want to curry favor with their bosses and get promoted to officiate at more championship games, they can do it on their own. It's a very tough subjective thing up to a point, a very difficult thing to referee. They have to make tough calls at lightning speed." Nader thinks the NBA should adopt instant replay and suspend "anti-disparagement" clauses, which contractually prohibit certain league criticism, during the off season, so that players and managers can air their concerns truthfully. "Otherwise, anti-disparagement clauses result in a 12-month cover-up," he says. Sports fans, says Nader, deserve the same protections as any other consumers. "They pay money as consumers to see the games, to buy products at the games, and they pay as taxpayers to subsidize arenas," he says. "They deserve fair consumer protection standards." Nader thinks sports fans face the same uphill battles as other consumers. "The corporate dictatorship of sports — exempted from the antitrust laws, full of secrecy, with anti-disparagement clauses, unilateral decisions, no explanation to the paying public — it's really a microcosm of a lot of what's going on in business today." But Nader feels the sports world should offer a refuge for fans. "They deserve a sanctuary of trust called sports, where they can really trust what's going on and escape, if you will, from politicians who are on the take, and corporations that are committing crimes against them," he says.